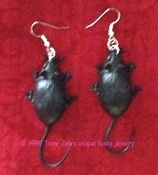 Big Funky Dangle BLACK MOUSE EARRINGS - Gothic Halloween Rat Rodent Animal Witch Charm Mad Scientist Laboratory Zombie Novelty Costume Jewelry - Large Retro Vintage Toy Mice Rats. Rubbery Plastic Dimensional Critter Charms, each approx. 1-5/8-inch long (4.06cm) without tail x 1-inch (2.5cm) wide x 1/2-inch (1.25cm) deep. (2.5-inch long WITH tail) You'll love these MEECES to PIECES! Great mad scientist accessory for your next weird science experiment!